The latest fuel price cuts from supermarkets could save motorists £200 a year as oil plummets to a six year low. As a result, petrol prices have fallen to a low as 105 pence-per-litre and diesel to 113 pence-per-litre. The huge fall in fuel prices has resulted in good news for motorists. Indeed, at 105 pence-per-litre, the cost of filling up a Ford Focus EcoBoost is now £57.75, as opposed to £72.05 in July 2014, when petrol prices were at an average of 131 pence-per-litre. Based on the official economy figure for a Ford Focus Ecoboost and an annual mileage of 10,000, the fuel cost reductions will save an owner £192.50 in a year. Should prices drop to 99 pence-per-litre that saving would be £236 annually. Diesel car owners are set to make significant savings too. Owners of the Honda Civic Tourer 1.6 i-DTEC will save £140.72 annually based on official economy figures and a pump price of 113 pence-per-litre, versus a pump price of 136 pence-per-litre from July 2014. Morrisons, Sainsbury’s, Asda and Tesco have announced price reductions at their filling stations as petrol prices edge ever closer to the £1 per-litre mark. Tesco has cut forecourt prices for petrol and diesel by two pence-per-litre and is offering an additional six pence-per-litre off to its Clubcard customers. Sainsbury’s has reduced diesel and petrol prices by two pence-per-litre, while Asda has put a nationwide price cap of 107.7 pence-per-litre on petrol and 114.7 pence-per-litre on diesel. On January 6 Chancellor of the Exchequer George Osbourne tweeted: "Oil price was $53 pbl last night - lowest in 5yrs. 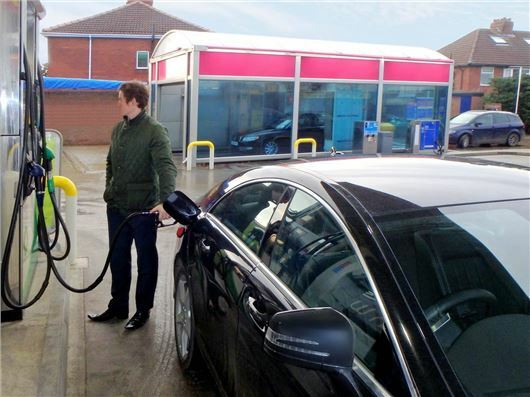 Vital this is passed on to families at petrol pumps, through utility bills and air fares." Since then the price of Brent Crude has dropped further, to around $50 a barrel. With continued oil price drops it's possible the cost of petrol will fall to below £1 per-litre, as predicted in December by RAC fuel spokesperson Simon Williams. He said: "The prospect of petrol going below £1 a litre in the new year is incredible, particularly when prices at the beginning of 2014 seemed to be heading ever upwards."